$13.00 In stock. Order in the next 19 hours, 48 minutes and it will go out today! 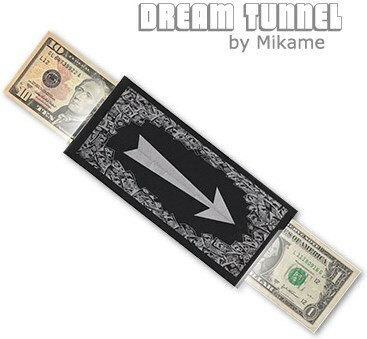 Dream Tunnel is THE transformation device, from the genius mind of Mikame, for your next routine. You can take pieces of blank paper or money and turn them into more money, coins, and even scarfs. You are only limited by your imagination. You can borrow a US $1 dollar from a spectator and ask them if they dream of more money. Send it down the Dream Tunnel. Tap on the Dream Tunnel and grab the money from the other end but it now has turned blank. Offer the blank piece of paper to the spectator and apologize to him that they didn't dream hard enough for more money. The spectator refuses, so you place it back into the Dream Tunnel. The spectator dreams of his money back at least, the magician taps on the Dream Tunnel, and the US $1 Dollar is faithfully restored back to the original bill.